EPA/DHA Essentials by Pure Encapsulations has no fishy after taste. Taking 2 capsules of EPA/DHA Essentials by Pure Encapsulations a day. EPA/DHA fish oil has been shown to promote heart healthy by supporting the metabolism of triglycerides and lipids‚ promoting healthy platelet function and maintaining healthy blood flow. One randomized‚ double-blind placebo controlled study that involved 223 individuals indicated that supplementing with fish oil can help maintain the integrity of blood vessels. Another study also shows that EPA might work to moderate protein kinase C‚ which would help support arterial smooth muscle cels. EPA DHA Fish Oil has also been shown in studies to support the health of your joints. In fact‚ many researchers believe that it is an essential part of your diet‚ if you want to maintain optimal joint function. EPA DHA moderates prostaglandin and leukotriene production‚ which helps to support healthy connective tissue. EPA DHA is also invlived in moderating neutrophil activity‚ which supports the comfort of joints. In one double-blind placebo controlled study‚ EPA DHA fish oil was shown to modulate immune mediator activity in addition to providing support for joint flexibility. This study involved 66 participants. Pure Encapsulations gets its EPA/DHA mostly from sardines and anchovies that were sourced off the coast of Norway or Chile. They have been tested to ensure that they don’t contain contaminants‚ such as heavy metals‚ furans‚ PCBs‚ anisidine or peroxides. 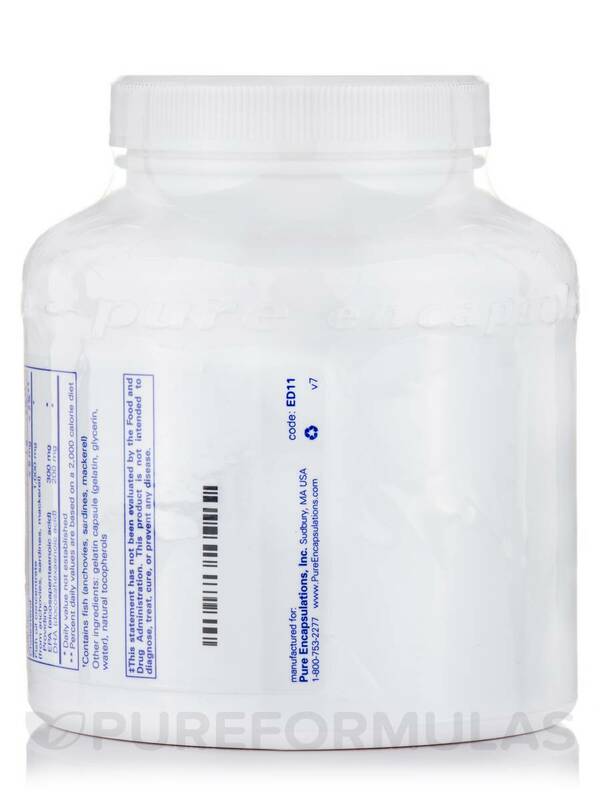 Pure Encapsulations also distills and microfilters its fish oil to ensure optimal quality. Researchers have noted that the appropriate balance of omega-6 to omega-3 fatty acids is 1:1; however‚ in the standard American diet‚ the balance is closer to 25:1‚ with many more omega-6 fatty acids being consumed. Omega-6 fatty acids are essential‚ but they can cause unwanted inflammation when consumed in excess. Omega-3 fatty acids work to counteract the inflammatory effects of omega-6s in the diet. EPA and DHA are both types of omega-3 fatty acids. So‚ anyone who is eating or has eaten the standard American diet (or another diet rich in omega-6 fatty acids) can benefit from taking EPA DHA Essentials. 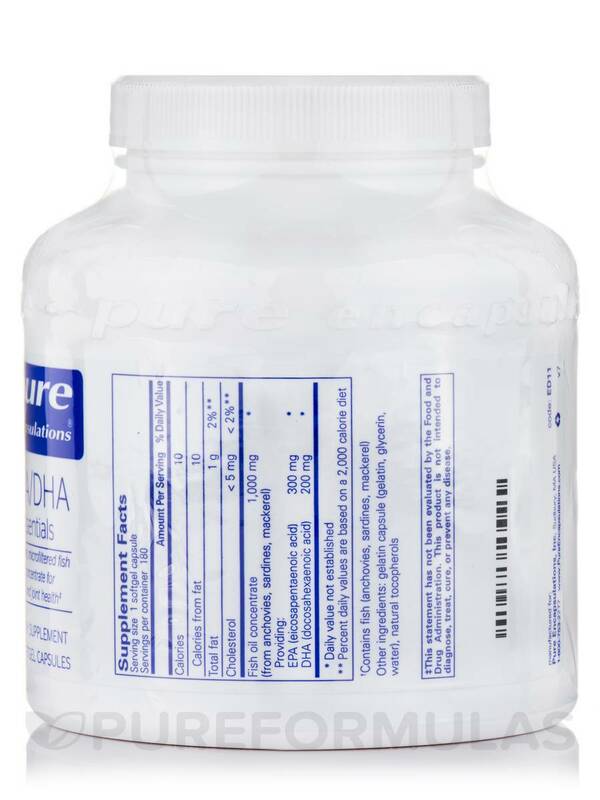 Also‚ as noted above‚ EPA and DHA may have positive effects on high cholesterol levels and joint pain‚ so anyone who is suffering such ailments may also benefit from taking EPA DHA Essentials by Pure Encapsulations. Can get a year's supply at one time. No aftertaste or burping. 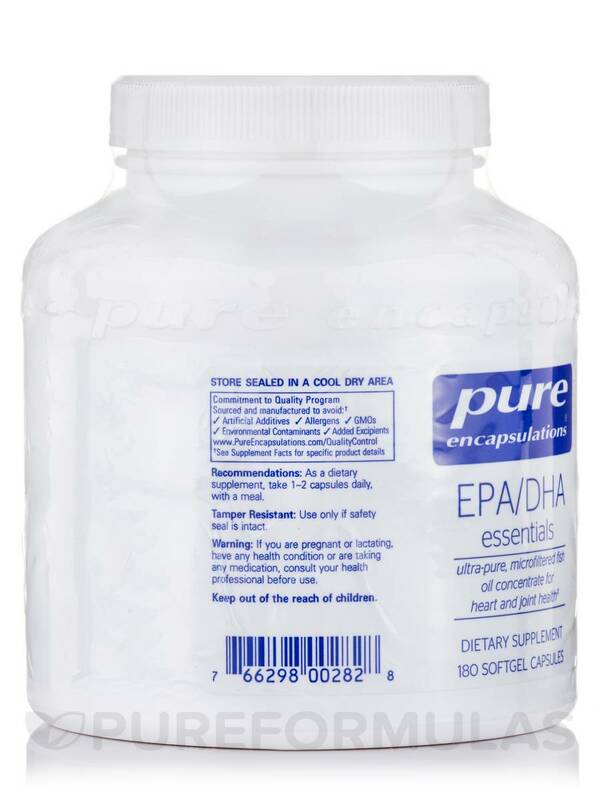 No aftertaste and smooth, textured nature of the EPA/DHA Essentials by Pure Encapsulations supplement are praiseworthy. 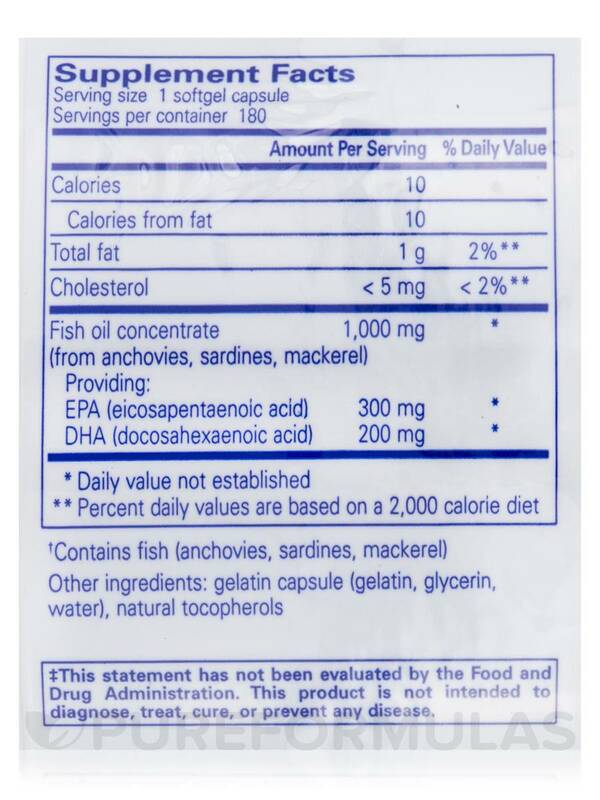 My naturpathic doctor recommended fish oil for general health, and I have been taking it for years with good results. This brand is the purest version I have found, which is important to me. Price is commensurate with quality, but still high. Easy to take, just one a day. Thanks PureFormulas. EPA/DHA Essentials by Pure Encapsulations is a good product, but you definitely have a fishy burps 30 minutes or so after taking it! Would like it in a taller more slender bottle for storage with my other vitamins/minerals/supplements. My husband and I wanted to try a cleaner brand so we went with this Pure Encapsulations one! This brand is recommended by many doctors in our area. So far we have been pleased with this brand and all that it has to offer. 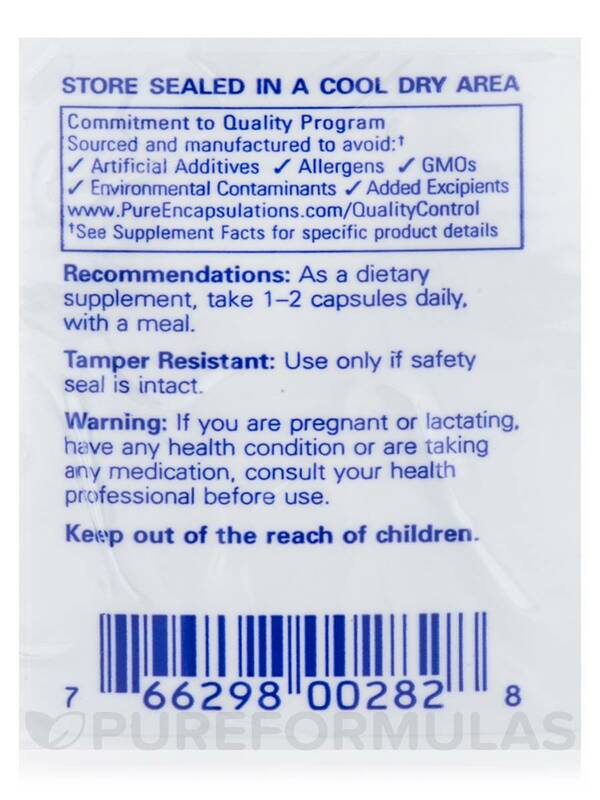 These pills in the EPA/DHA Essentials are somewhat large, but easy to swallow. Helps with mental clarity, and to decrease inflammation I our bodies. Our whole family takes EPE/DHA Essentials by Pure Encapsulations. Clean source of fish oil, no fishy taste. 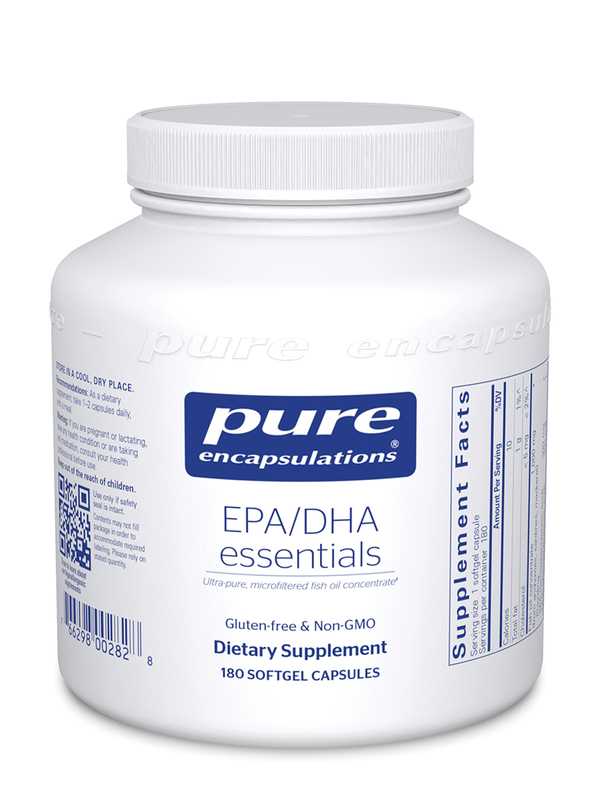 I thought EPA/DHA Essentials by Pure Encapsulations sounded like a great deal with good levels of EPA and DHA. However, they went rancid fast. Within a couple months they stink pretty bad.